The SEC charged a US shipping company and its CFO with tax reporting violations for failing to properly report approximately $512 million of tax liabilities. 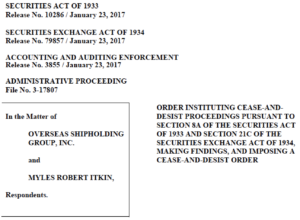 In its Order imposing the sanctions, the SEC alleged that Overseas Shipholding Group, Inc. (“OSG” or “the Company”) and its CFO, Myles Itkin, committed tax reporting violations by failing to record material federal income tax liabilities on the Company’s financial statements from 2000 through early 2012. During this period, the Company’s credit agreements were jointly and severally guaranteed by Overseas International Group Inc. (“OIN”) and Overseas Bulk Ships (“OBS”), both of which were wholly owned subsidiaries of OSG. According to the SEC, because both OIN and OBS were wholly owned subsidiaries of OSG, the amounts available and borrowed under the credit agreements should have been recorded as liabilities for tax reporting purposes. Since the two subsidiaries were controlled foreign corporations, the tax liabilities should have been reported under Internal Revenue Code Section 956. That Section states that if a controlled foreign corporation is the guarantor for debt of its U.S. parent company, the monies borrowed by the parent company, in this case OSG, are considered “deemed dividends” and thereby taxable to the parent (OSG). The SEC alleged that, by failing to properly record the transactions, OSG understated its tax liabilities by approximately $512 million during the twelve-year period. As a result, OSG’s total liabilities for the time period were understated by 17%. Had the transactions been properly reported, OSG’s net loss during this timeframe would have increased 265%. According to the Order, OSG did not report the issue to its outside auditors or seek guidance on the impact of the credit agreements on its financial reporting requirements. The Commission therefore determined that OSG had inadequate and deficient internal accounting and financial reporting controls. OSG and Itkin resolved the tax reporting and related charges by entering into a settlement with the SEC. Among other things, the Order required OSG to pay a $5 million penalty. Itkin agreed to pay a $75,000 penalty.